458 pages | 72 Color Illus. | 64 B/W Illus. Engineering the physical, chemical, and energy properties of lignocellulosic biomass is important to produce high-quality consistent feedstocks with reduced variability for biofuels production. 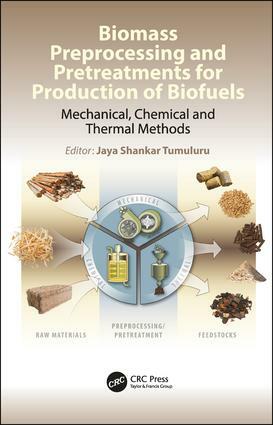 The emphasis of this book will be the beneficial impacts that mechanical, chemical, and thermal preprocessing methods can have on lignocellulosic biomass quality attributes or specifications for solid and liquid biofuels and biopower production technologies. "Preprocessing" refers to treatments that can occur at a distance from conversion and result in an intermediate with added value, with improved conversion performance and efficiency. Dr. Jaya Shankar Tumuluru is a senior scientist in the Biofuels Department at the Idaho National Laboratory. He is the principal investigator for the Biomass Size Reduction, Drying, and Densification project supported by the Bioenergy Technologies Office at the U.S. Department of Energy. At INL his research is focused on mechanical and thermal preprocessing and pretreatments of biomass. Dr. Tumuluru has also worked on understanding the storage behavior of woody, and herbaceous biomass, biomass drying, food processing using extrusion cooking, shelf-stable food products, food storage, and process modeling and optimization. He has acted as a reviewer for many high impact factor journals in bioenergy and food processing. He has also reviewed the proposal for national, international grant agencies. He has published more than 100 papers in the peer-reviewed journals, book chapters, conference proceedings and has presented more than 80 papers in national and international conferences. He has received numerous awards, such as outstanding reviewer for American Society of Agricultural and Biological Engineers, and INL’s Outstanding Achievement in Scientific and Technical Publication, Asian American Engineer of the Year Award for 2018 and R & D 100 award finalist for the year 2018. Dr. Jaya Shankar Tumuluru did his Ph.D. in Agricultural and Food Engineering, from Indian Institute of Technology, Kharagpur, India.